Choose Image ^ Mode ^ Bitmap to convert a grayscale image to exclusively black-and-white pixels. This may sound like a boring option, but it can prove useful for gaining complete control over the printing of grayscale images. After all, output devices, such as laser printers and imagesetters, render grayscale images as a series of tiny dots. Using the Bitmap command, you can specify the size, shape, and angle of those dots. 4 Output: Specify the resolution of the black-and-white file. If you want control over every single pixel available to your printer, raise this value to match your printer's resolution. As a rule of thumb, try setting the Output value somewhere between 200 to 250 percent of the Input value. 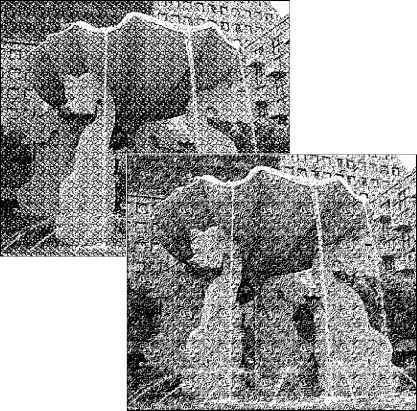 Figure 4-5: The Bitmap dialog box converts images from grayscale to black and white. 4 Pattern Dither: To dither pixels is to mix them up to emulate different colors. 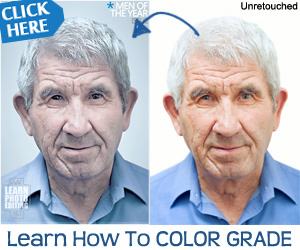 In this case, Photoshop mixes up black and white pixels to produce shades of gray. The Pattern Dither option dithers an image using a geometric pattern. Unfortunately, the results are pretty ugly, as demonstrated in the top example in Figure 4-6. And the space between dots has a tendency to fill in, especially when you output to a laser printer. 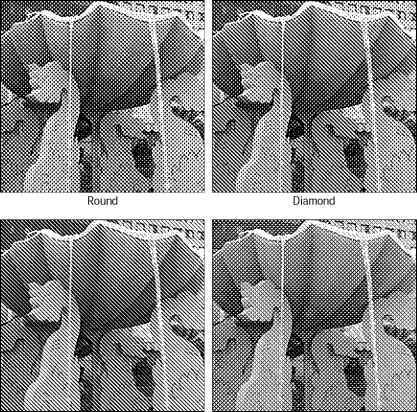 ♦ Diffusion Dither: Select this option from the Use pop-up menu to create a mezzotint-like effect, as demonstrated in the second example in Figure 4-6. Again, because this option converts an image into thousands of stray pixels, you can expect your image to darken dramatically when output to a low-resolution laser printer and when reproduced. So be sure to lighten the image with something like the Levels command (as described in Chapter 17) before selecting this option. Figure 4-6: The results of selecting the Pattern Dither option (top) and the much more acceptable Diffusion Dither option (bottom). ♦ Halftone Screen: When you select this option from the Use pop-up menu and press Enter, Photoshop displays the dialog box shown in Figure 4-7. These options enable you to apply a dot pattern to the image, as demonstrated in Figure 4-8. Enter the number of dots per inch in the Frequency option box and the angle of the dots in the Angle option box. Then select a dot shape from the Shape pop-up menu. Figure 4-8 shows examples of four shapes, each with a frequency of 24 lines per inch. Figure 4-7: This dialog box appears when you select the Halftone Screen option in the Bitmap dialog box. Figure 4-8: Four random examples of halftone cell shapes. In all cases, the Frequency value was set to 24. I cover screen patterns and frequency settings in more depth in the "Changing the halftone screen" section of Chapter 18. ♦ Custom Pattern: If you've defined a repeating pattern using Edit ^ Define Pattern, you can use it as a custom dither pattern. Figure 4-9 shows two custom examples. I created the first pattern using the Twirl Pattern file, which is stored in the Displacement Maps folder in the Plug-Ins folder. I created the second pattern manually using the Add Noise, Emboss, and Ripple filters (as discussed in the "Creating texture effects" section of Chapter A on the CD-ROM for this book). Figure 4-9: Two examples of employing repeating patterns (created with Edit^ Define Pattern) as custom halftoning patterns. For a complete guide to creating and defining patterns in Photoshop, see the "Applying Repeating Patterns" section of Chapter 7. 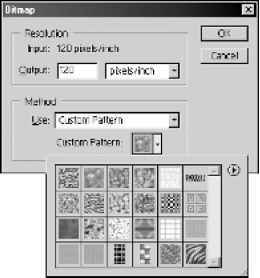 To use a custom pattern, open the Custom Pattern palette in the Bitmap dialog box, as shown in Figure 4-5. Click the icon for the pattern you want to use. If you don't feel like creating your own patterns, use one of the preset patterns that ship with Photoshop 6. A number of these patterns appear by default in the palette; to access additional patterns, choose Load from the palette menu (click the right-pointing triangle in the upper-right corner of the palette to display the menu). You can find the patterns in the Patterns folder, which lives inside the Presets folder. To delete a pattern from the palette, click its icon and choose Delete from the palette menu. Photoshop lets you edit individual pixels in the so-called bitmap mode, but that's about the extent of it. After you go to black-and-white, you can neither perform any serious editing nor expect to return to the grayscale mode and restore your original pixels. So be sure to finish your image editing before choosing Image ^ Mode ^ Bitmap. Even more important, make certain to save your image before converting it to black-and-white. Frankly, saving is a good idea prior to performing any color conversion. How do you create a black and white bitmap?